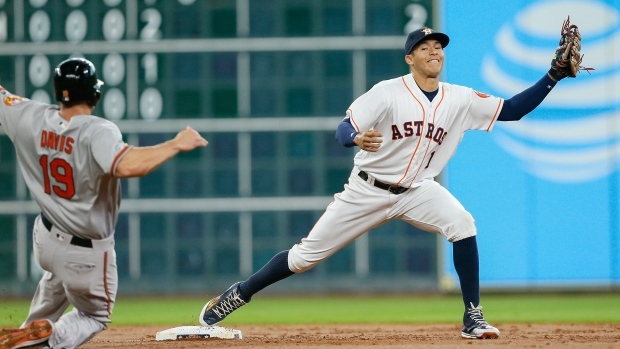 HOUSTON — When the Baltimore Orioles walked the two batters ahead of Houston's Carlos Correa to load the bases in the 13th inning on Tuesday night, the star shortstop had only one thought. "I'm going end this," Correa said. Correa's tiebreaking single lifted the Astros to a 3-2 win over the Orioles that ended a four-game losing streak. Rookie Tony Kemp hit his first career triple off Dylan Bundy (0-1) and over the head of Adam Jones, who was playing shallow in centre field, with no outs in the 13th inning. The Orioles then intentionally walked George Springer and Jose Altuve to bring last year's rookie of the year to the plate. Correa snapped an 0-for-15 skid with an RBI single into shallow centre that scored Kemp. "It feels great to get a hit ... I was visualizing us celebrating after my at-bat," Correa said. "So good it happened. It's really good it happened." Manager A.J. Hinch was glad to see Correa get a big hit after struggling a bit lately. "His season is below the standard in which he's going to live in his career," Hinch said. "But we are only in May (and) there are going to be a ton of stretches where he's going to be the highlight of the night, and tonight was one of them." Michael Feliz (2-1) struck out the side in the 13th for the win. Pedro Alvarez and Manny Machado hit solo home runs for the Orioles. Luis Valbuena had a two-run homer for Houston in the fifth. Houston used six relievers after starter Doug Fister left with two outs in the sixth, and they combined for 16 strikeouts. That tied a franchise record for most strikeouts by the bullpen in a single game that was set on April 25, 1962 against St. Louis. Fister fanned two to give Houston a season-high 18 strikeouts on Tuesday. "It's kind of something we have had a challenge with," manager Buck Showalter said of the strikeouts. "Tonight, you're going to give credit to their pitchers. They are good. Ours are, too. They are saying probably the same thing over there, but they got the 'W,' so they aren't looking at it the same way." Baltimore had runners at first and second with one out in the 12th, but Scott Feldman struck out Jones and Chris Davis to leave them stranded. It's the longest game of the season for the Orioles, who had just two extra-inning games entering Tuesday, both of which were 10 innings. Houston has played longer, beating the Indians 5-3 in 16 innings on May 11. The Orioles had a chance to win it in the ninth, loading the bases with two outs, but Luke Gregerson struck out Joey Rickard to end the threat. Chris Tillman yielded three hits and two runs with five strikeouts in seven innings. Fister allowed three hits and two runs in 5 2/3 innings. The Orioles had just one hit, a single by Jonathan Schoop in the second inning, before Alvarez sent one into the seats in right field to start the fifth. Catcher Jason Castro helped Fister in that inning when he slid on his knees to make an acrobatic catch near Houston's dugout on a foul ball hit by Schoop for the first out. Machado snapped out of an 0-for-11 slump in a big way when he hit a solo homer onto the train tracks beyond left field to start the sixth inning to tie it at 2-2. Colby Rasmus was ejected for arguing with the umpire after he struck out looking in the sixth inning. Orioles: RHP Yovani Gallardo (right shoulder tendinitis) is expected to throw a simulated game on Saturday and will likely throw one more simulated game before beginning a rehabilitation assignment. Astros: OF Carlos Gomez, who is on the disabled list with a bruised left ribcage, went 0 for 3 and was hit by a pitch as the designated hitter in the first game of a rehabilitation assignment with Double-A Corpus Christi on Tuesday. He'll play centre field on Wednesday in Corpus Christi. Orioles: Tyler Wilson (2-2, 3.68) is set to start for the Orioles on Wednesday. Wilson looks to bounce back after allowing six hits and five runs in six innings of a 7-2 loss to Seattle. Astros: Collin McHugh (4-4, 5.13) will make his 10th start on Wednesday. McHugh pitched well in his last outing, allowing five hits and two runs in seven innings, but took the loss as he was outpitched by Chris Sale in a 2-1 win by the Chicago White Sox.